Egyptian culture and society was always been strongly linked to religion. With a Muslim majority, many of its festivities and celebrations have to do with certain dates in the Qur'an like the birth of Muhammad, the moment in which Abraham gave his son as an offering to Allah, Ramadan or the New Year according to the Arabic calender. Also, the Egyptians do not forget their gods of the past nor their ancestral traditions linked to life in the countryside and along the banks of Nile River. Some of the festivities thank and ask the gods for an abundance of crops and successful harvests. 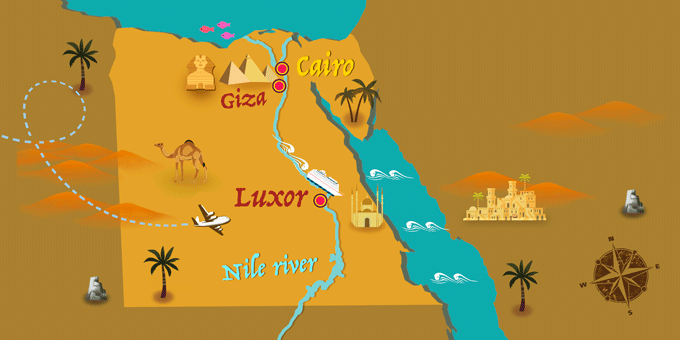 Cairo also plays host to a number of cultural celebrations every year such as festivals of cinema, literature and music. Also called the Feast of the Lamb or the Sacrifice, this religious celebration commemorates the day when Abraham was going to kill his son but instead Allah offered him a lamb. During those days there is a massive pilgrimage of the faithful to Mecca, while those who remain in the cities celebrate by offering the parts of a lamb to the needy, to friends and to family. More than 4,500 years old, this Egyptian festival commemorates the arrival of spring. In Ancient Egypt it was customary to make offerings to the gods with seasonal foods to thank them for good harvests. Currently, this festival attracts thousands of people who come to the Nile to enjoy its seasonal cuisine such as herring and vegetables. They also sing, dance and sail in traditional felucca boats along the river. Ramadan is celebrated in all Arab countries on a date depending on the lunar calendar. This holiday is known because, throughout the month, Muslims practice fasting from dawn until the sun sets as a symbol of respect for Allah, as dictated by the Koran. In Egypt during those days you can see restaurants, cafes and houses decorated with the colors of this holiday. Many of them open until dawn and sell speciality products like nuts and dates for when the daily fast finishes. This Islamic holiday, which is celebrated after Ramadan, celebrates the breaking of the fast. The Eid al-Fitr begins in the early morning, at which time you can hear the prayers of the faithful in the mosques. Afterwards, they all enjoy a good breakfast together and visit the houses of family and friends to enjoy further communal eating and festivities. Men often show off new white clothes and children receive gifts. This Muslim feast pays homage to the birth of Muhammad, the prophet of Allah. In Egypt this celebration is enjoyed more intensely than in other Arab countries. The mosques are illuminated, the streets of Cairo are filled with stalls and there are markets selling traditional food. Translated as the "Bride of the Nile", this traditional festival celebrates good harvests due to the absence of floods after the construction of the Aswan dam. According to legend, ancient Egyptians sacrificed a virgin by drowning her in the Nile as an offering so that the gods could help them to obtain a successful harvest. A tradition that has survived over time, but exchanging the woman for a wooden or clay doll that is dressed as a bride. Held annually, this festival that is organized in the Egyptian capital of Cairo brings together the best national and international artists of Arabic music. The performances, organized by the Cairo Opera, take place in the Giza Exhibition Center, in a large venue where spectators from all over the world attend every year. The Muslim New Year depends on the lunar calendar, so it can vary from year to year. On this day the exodus of Muhammad is celebrated,and the faithful go to the mosques to pray and to enjoy different ceremonies. The same New Year's Day is a national holiday, so most people have the day off work to enjoy the nationwide celebration.